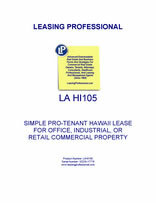 This form is for a single tenant Hawaii lease where the tenant has superior leverage. It gives the tenant the right to use the premises for "any legal use," and has very abbreviated remedies for the landlord in the event of a tenant default. It is also pro-tenant in character because of the clauses it does not contain which customarily appear in pro-landlord forms relating to remedies and a variety of other pro-landlord provisions. Hawaii is the southern-most state of the nation, and despite its small size, it is the forty-second most populous state. The tropical islands’ main hazard are their numerous volcanoes, many of which are perpetually active. Hawaii is a prime destination for tourism and travel.